Castanets have long evoked an image of Spanish music and dance but they weren't traditionally a part of flamenco. They have been a part of the Escuela Bolera, Classico Español and folkloric repertoire. Now there are many dancers who choose to use castanets with flamenco dance. How to wear your castanets. In the video below José demonstrates how to put on your castanets to prepare to play them. You'll see him point out a mark in the top of one of the castanets. This is so you know which castanet goes on which hand. The castanet with the mark has a slightly higher tone and goes on the right hand. The other castanet which has a lower tone, goes on the left hand. The loops are placed over the thumb of each hand and then tightened so that the two halves separate slightly ready to be played. First position - Starting position for learning castanets. When you begin to practice castanets having correct posture is important. Begin by standing with your feet in parallel position and your arms at first position. Your hands should be slightly curved at the wrist with the palms facing towards to body. Each sound that you make with a castanets has a corresponding onomatopoeic sound to go with it. The first two sounds that you will learn go along with the first exercise demonstrated in the video below. The first sound is 'Ta' which is made by tapping the left middle finger in the middle of the left castanet. The second sound is 'Pi' which is as you can guess is made by tapping the right middle finger on the right castanet. Remember to start slowly with good technique and an even sound before you try to speed up. #FBTip - Slip a sock over one half of each castanet to keep the noise down if you are practicing at home. 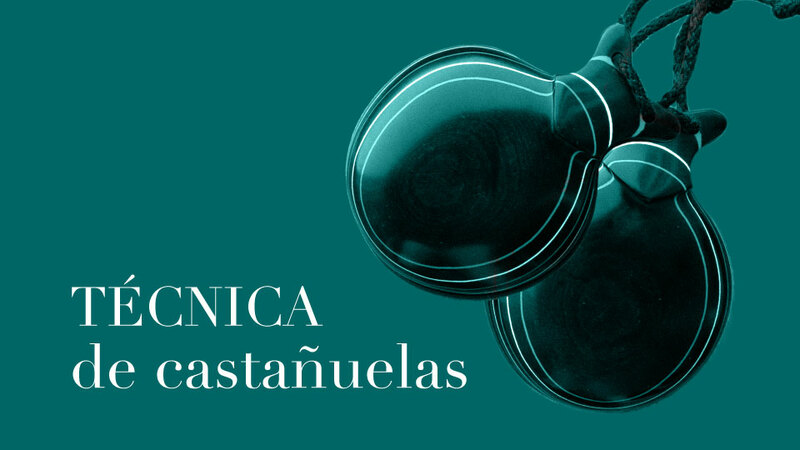 If you are interested in studying castanets more deeply we have a technique class available in our online dance studio danza estudio Flamenco Bites. With maestro Jose Merino you will learn all of the exercises that he teaches his students at his studio in Madrid and how to start combining your castanets with movement.